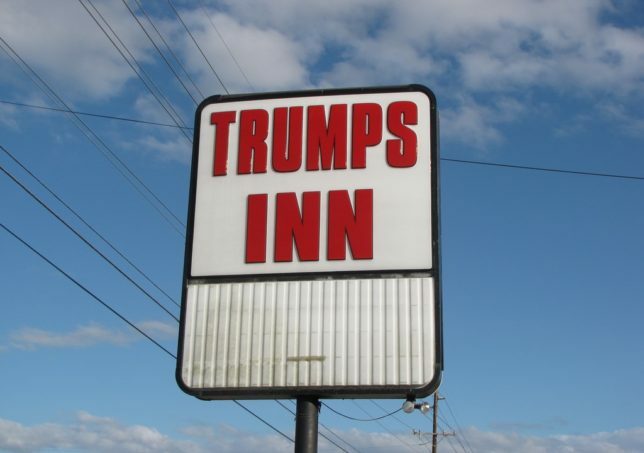 The Trump name may be famous but it isn’t always connected to the business dynasty founded by Fred Trump, as these 7 Trump-named businesses illustrate. If you thought the Trump dynasty was fueled by real estate, well… yeah, that’s actually correct. “Trump Oil”, on the other hand, isn’t (or wasn’t) even American. 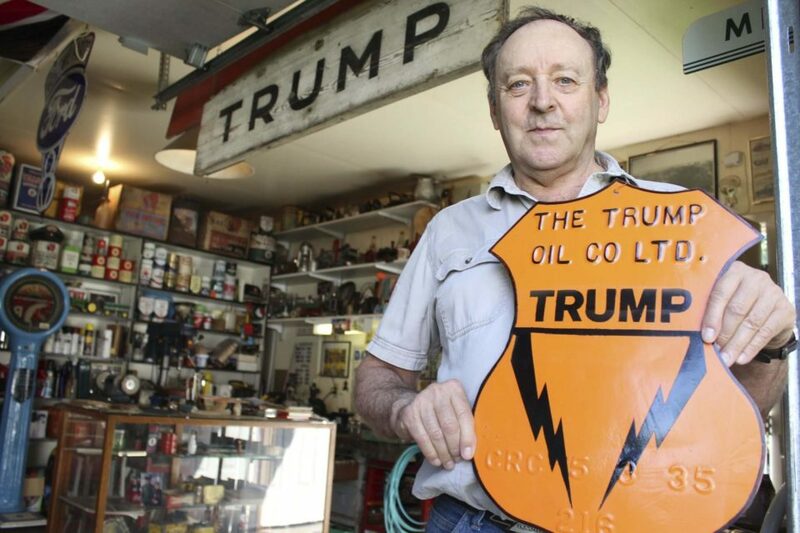 According to petroliana collector Harvey Thiessen, the Trump Oil Company operated a small oil refinery in Morris, Manitoba, about 40 miles (60 km) south of Winnipeg. 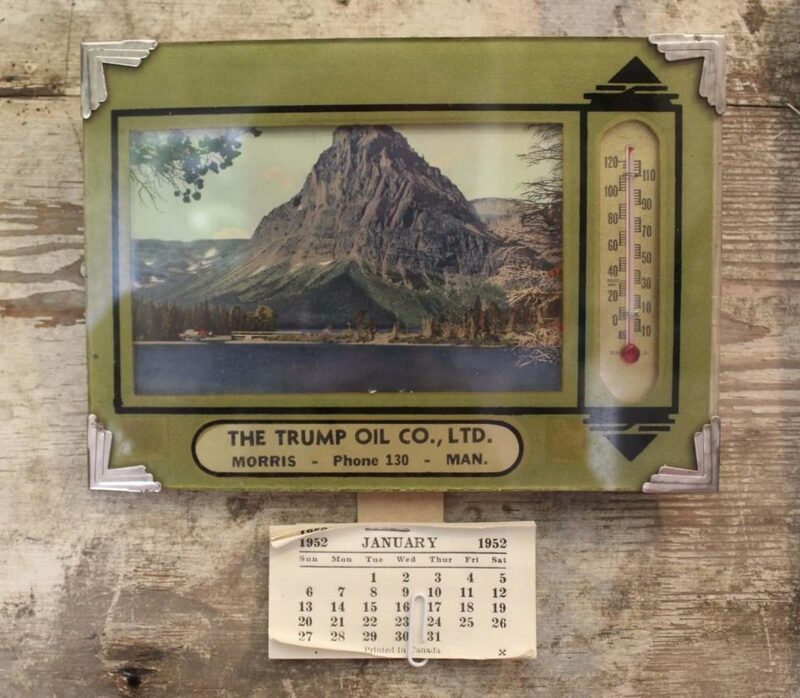 Drivers in the pre- and post-war era could fill ‘er up at Trump Oil pumps and score a souvenir calendar with a built-in thermometer. 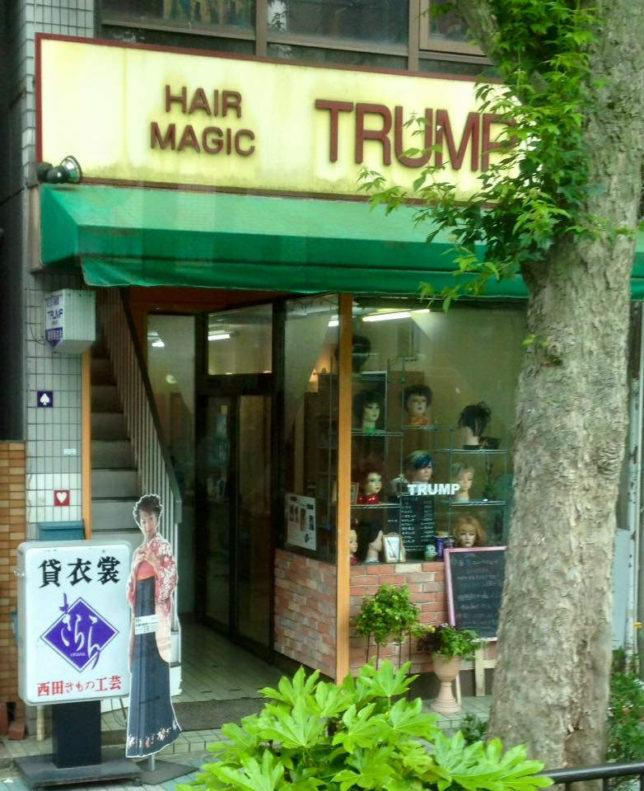 Hey, is that Kenny Blankenship from MXC standing outside Trump Hair Magic in Kyoto, Japan? Right you aren’t, Ken! Someone needs to bring Jimmy Fallon to this place so he can muss up the wigs in the store’s front window. Flickr member sprklg snapped the shop’s weathered storefront in June of 2016. 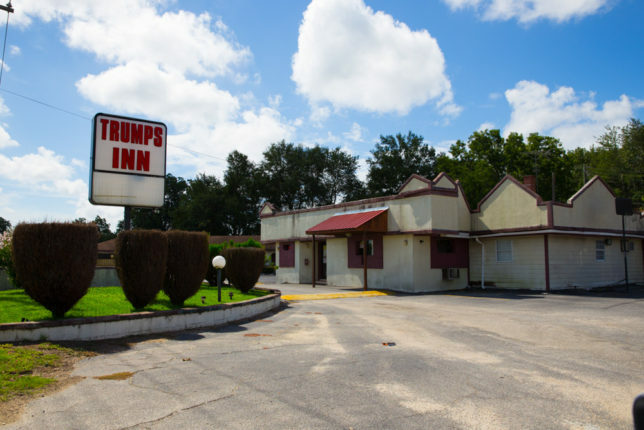 “Trumps Inn is a ‘no tell motel’ on U.S. Route 301 in Orangeburg, South Carolina,” according to Flickr member Gerry Dincher, who photographed the inn’s bland and generic sign in early 2018. “I should have taken a picture of it (the inn), too,” added Dincher, “but the place gave me the creeps.” Better the creeps than the cooties, or so they say. Good thing fellow Flickr member Brian Copeland (blcope) captured the above wide-angle view and by the way… where is everyone? Alternative facts state the place is doing a yuuuge amount of business, especially compared to Obamas Inn. Sees her by the… hmm, never mind. 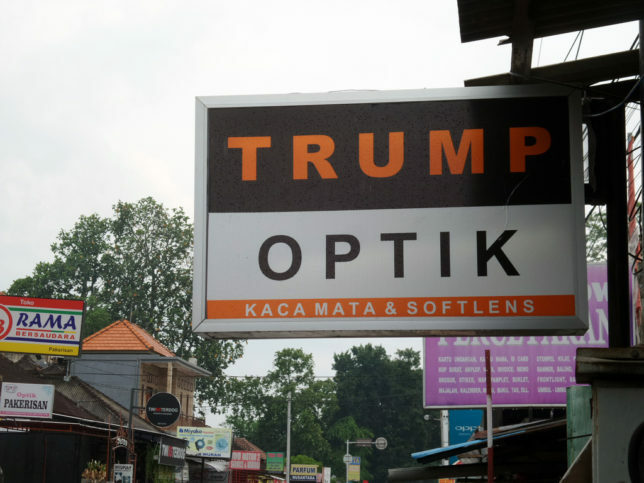 Trump Optik is located in Bali, Indonesia, and judging from the professional-looking sign it may be part of a larger chain of optometrist stores. Flickr member Ya, saya inBaliTimur saved the snazzy shop sign for photographic posterity in March of 2018. As if the charitable Trump Foundation didn’t have enough legal problems… hold on, this is “Doner Trump”, not “Donor Trump”. Also known as Shawarma or Gyros, Doner kebab is a Middle-Eastern fast-food meat cooked on a spinning vertical rotisserie. 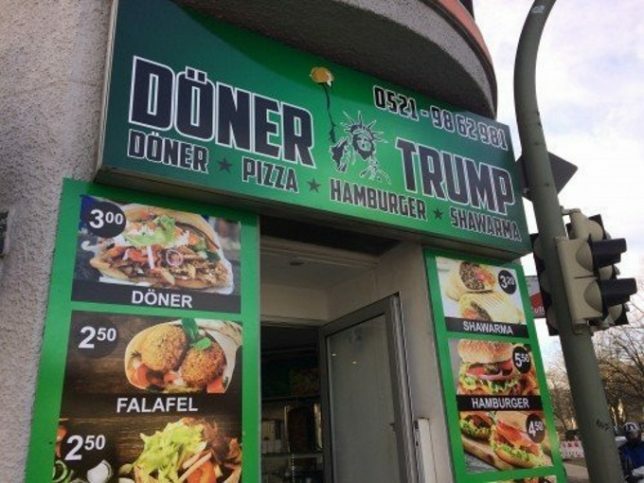 If the shop-owners want to appeal to The Donald himself, however, they’ll need to rename it McDoner. The sign boldly features a likely (ya think?) unauthorized image of Donald Trump, as snapped by Flickr member LoveBelfast Belfast in June of 2017. 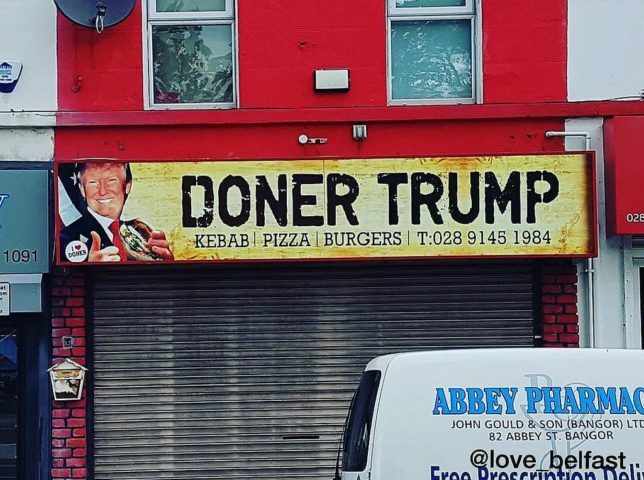 So who’s Donald Trump gonna sue first, Doner Trump from Belfast or Döner Trump from Germany, land of Trump’s ancestors? The above shop in Bielefeld uses a Statue of Liberty graphic on its sign, rather than the Belfast store’s Trump photo. Either way, it seems Europeans equate America with Trump and Liberty… though never the twain shall meat. 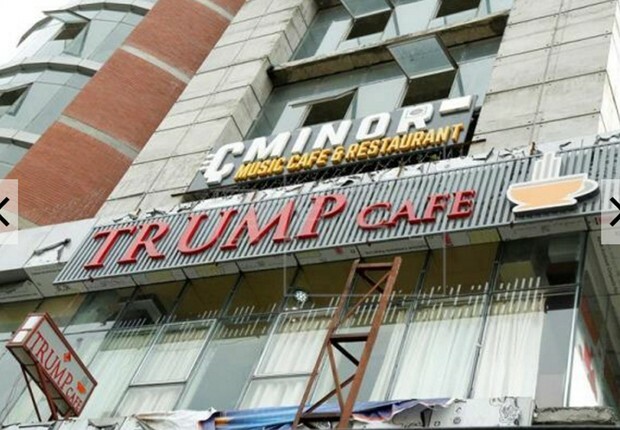 “Many people think he is a joke, but he is an inspiration for me,” explains Saiful Islam, owner of the Trump Café in Dhaka, Bangladesh. “I did not start the business with any specific thought in mind,” adds Islam, “just the fact that I am a big fan of US President Donald Trump.” Customers who share Islam’s admiration of the 45th president can order a signature Trump Cocktail and pose for photos with a life-size cardboard cutout of Trump. Flickr member Leonardo Assad Aoun (leonardoassad) posted the above image of the storefront sign in July of 2017. While not a Trump-named business per se, the Shambala Furniture Warehouse in Hong Kong gladly enlisted Donald Trump to promote the “hair-raising discounts” at its going-out-of-business sale. 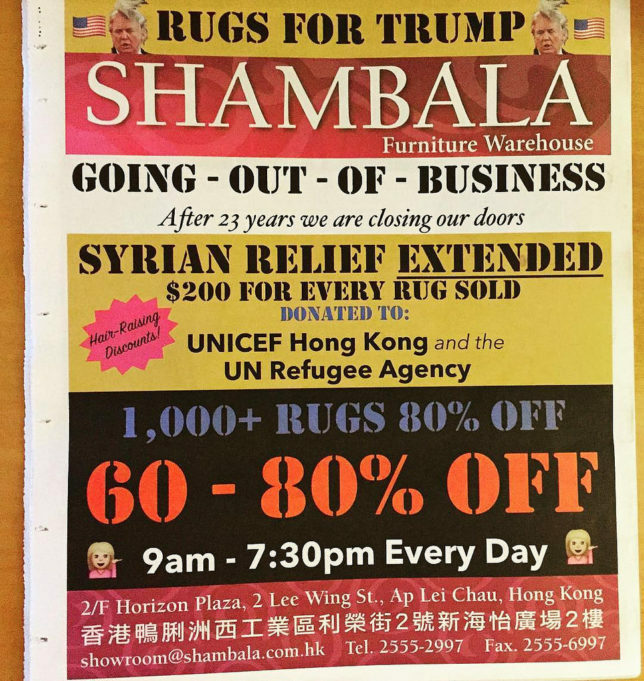 Unlike the previously featured café owner, however, this shop seems to be trolling Trump on an epic scale: a portion of the proceeds from rug sales will be donated to Syrian refugees via UN agencies Trump has recently ceased funding. Last but not least, the sign’s “Rugs for Trump” header features an unflattering photo of Trump with his “rug” blown askew by the wind. Sad.